GET UP TO 100 PAYLINES BONUS! Wolves! Wolves! Wolves! Has arrived to Fly Casino. This unique slot is 5 reels, but paylines can range between 40 and 100 on ANY spin! 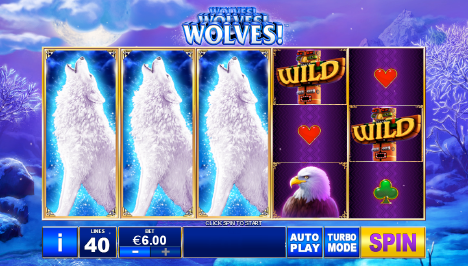 Available to play on download and direct website play, the two key elements of this game are stacked wolf symbols as well as a Mystic Totem feature where the reels can expand up to 9 rows high with up to 100 paylines! The wolf symbol is a mega symbol that is stacked on all reels. Get five wolf symbols and your paid out is 750X. The wild feature substitutes for all symbols and this symbol is very abundant as you play. Mystic Totem Feature: You’ll get it a lot! This feature is triggered randomly on any spin and takes place over 1 to 3 spins within the feature. We can tell you that this feature triggers very often. The reels can grow up to 9 rows high on any spin with each new row giving you 10 additional paylines – if the reels grow up to 9 rows high, you’ll play with 100 paylines in total. $40 Gets $60.00 X 2 Bonus! On Sunday from 00:00GMT until 23:59 GMT, all members on their deposit of just $/£/€40 or more will receive a $/£/€60.00 bonus. Claim it 2X. Easy $100! From 00:00GMT until 23:59 GMT, all members on their deposit of $/£/€30 or more will receive a 100% $/£/€100.00.